Small companies will be empowered by AI and large enterprises will become more responsive to their customers. When Artificial Intelligence (AI) was just science fiction, nobody thought it would become a real force in the business world. But nearly 50 years after Hal in “2001: A Space Odyssey,” fantasy has morphed into a positive reality, and AI is now a business game-changer. 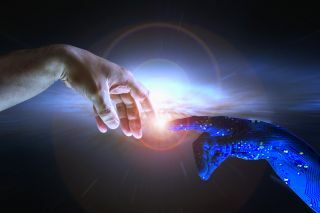 While AI is not yet the omniscient (or ominous) presence it was in “2001,” the facts are that IT management can help business partners in sales and marketing be more successful by implementing AI solutions, and here is an example of one that is easy to slot right in and show immediate value: Conversica. Conversica is the leader in conversational AI for business, because we are truly at the vanguard of deploying AI to help businesses find customers and drive revenue. Friendly, persistent, conversation-based AI is the perfect tool for following up on sales leads that would otherwise be left to die, with the true value of AI-enabled sales being that it drives greater ROI from marketing and sales programs. That’s because AI never gives up until a lead is gracefully transitioned to a live sales rep or opts out. Driving this type of value from sales-centric AI is why our solution has rapidly made inroads and established a commanding market position across many industries – including technology, financial services, education, hospitality, and automotive. We are enjoying explosive growth and financial success by serving more than 1,000 customers, including Epson, IBM, Microsoft, Box, ScaleArc, and the Los Angeles Film School. Our conversational AI platform has learned the best way to engage sales leads from hundreds of millions of conversations, and some 35 percent of those leads respond to outreach from our multichannel, multilingual AI sales assistant. Companies can even deploy multiple assistants, leveraging conversations optimized for separate business functions. Each assistant benefits from the training, experience, insight and results gained from the thousands of other assistants in the field across all customers, resulting in more engaging and helpful conversations than are possible in a stand-alone manner. What’s more, AI assistants now engage each individual on their preferred channel and in their preferred language and are intelligent enough to automatically switch mid-conversation when appropriate. These advanced capabilities, along with deep integrations with leading CRM and marketing automation tools, are why Conversica customers report 30X increases in influenced sales pipeline and 20-to-1 ROI on their Conversica investment and why Gartner recognized Conversica as a Cool Vendor. Increased annual recurring revenue by over 50 percent, with sales to new customers and significant expansions in existing accounts. Released new AI capabilities—including support for conversations via text/SMS messaging, new assistant languages (Spanish and French) and automated meeting scheduling—and processed more than 250 million messages. Earned the Red Herring Top 100 award, distinguishing the company as one of the Top 100 private technology companies in North America. Named for a second time to the Inc. 5000 list of the fastest growing private companies. Dr. Sid J. Reddy, Chief Scientist: Reddy is a noted expert, author and speaker in Natural Language Processing (NLP) and computational linguistics. He joins Conversica from Microsoft, where he was a Principal Applied Scientist. He has designed and contributed to dozens of NLP systems used in production in a wide array of use cases and industry verticals, including business intelligence, legal, healthcare, life sciences, and e-commerce. Brian Kaminski, Chief Customer Officer: Kaminski is an accomplished customer success expert with 20 years of experience rapidly scaling winning teams. Kaminski comes to Conversica from IBM, where he served as a worldwide client success executive and developed the strategy for customer success across IBM’s SaaS portfolio. Prior to that he was Chief Customer Officer at Marin Software. Victor Belfor, Senior Vice President of Business Development: Belfor has more than 15 years of go-to-market strategy and execution experience and joins Conversica from OpenSesame, where he managed partnerships ranging from Oracle and SAP to Workday, Cornerstone and OnDemand. Prior to that he established the partnership programs for Ring Central, helping to accelerate growth prior to a successful IPO. Conversica has helped take AI from pure fantasy to productive business reality, and the increased sales opportunities with provable ROI show that AI is here to stay. As organizations continue to see success with AI, new applications will emerge and drive value across departments and business functions, delivering humanistic interactions while improving the customer experience. AI will empower small companies to seem big and big companies to stay closer to customers and be more responsive. Far from being a scary, all-knowing presence, carefully applied AI technology can drive “human” conversations that help people create new opportunities more quickly, efficiently and cost-effectively. Ultimately, AI will free up humans for higher-value tasks and drive employment. And our customers are proving it on a daily basis, as many are making new sales hires because their AI assistant is setting more and more meetings. This is why Conversica is so excited about being at the center of the AI market – a powerful position where we can create value for customers, end users and investors simultaneously.